The ‘théière Chinoise ronde’ was designed for the Sèvres porcelain factory by Alexandre-Evariste Fragonard in 1831-1832. The Director of the factory, Alexandre Brongniart, was fascinated with East-Asian design and this piece was most likely inspired by Chinese porcelain, demonstrating the European vogue for exoticism during this period. A drawing of 1832 by Fragonard is preserved in the archives at Sèvres, in which the Asian-inspired form is decorated with chinoiserie figures. 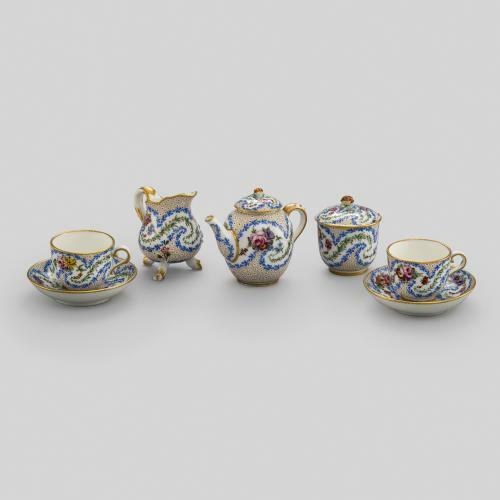 Only eleven examples of this design were produced between 1832 and 1846, all of which were single pieces without accompanying tea wares. This example, dated 1846, was probably one of the last made at the manufactory. 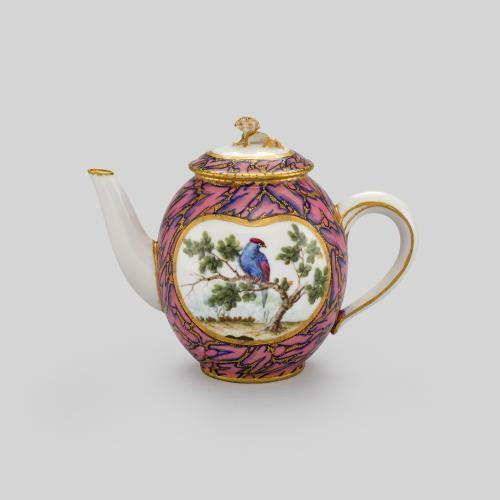 It is almost certainly that which entered in the factory’s sales records for 31 December 1846, described as ‘Théière chinoise ronde Fragonard, décor en or et couleurs dans le style chinois’. The production cost was noted as 175 francs, the selling price as 200 francs. [vv4. Fol 84 v-34]. An example of this model, dated 1832, and sold to Queen Marie-Amélie of France in 1837 is now in the collection of the Metropolitan Museum of Art, New York (accession no. 2007.408a,b).